The A-List in Hollywood is filled with beautiful people – and the ‘Hollywood smile’ is famous around the world as an essential facet of red carpet beauty. If you look through magazines you will see regular reference to the best celebrity smile makeovers, showing amazing cosmetic dental work. However while many celebrities have had extensive dental work, many appearing in those lists have only had minor changes made to their teeth. The important thing to remember is that a good dentist will know what will work: and that in many cases a small change can make a BIG difference. Our dental professionals here at Crescent Dental have taken a look at some well-known celebs to see what kind of work may have transformed their smiles! 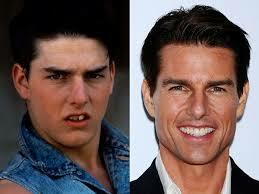 One of the best examples of a celebrity smile makeover is Tom Cruise. In his early career he didn’t exactly have the movie star smile and by his own admission this came between him and certain film roles. Tom suffered from overcrowding and his teeth were quite badly misaligned. Some basic cleaning procedures, a few veneers and a few months of invisible braces ensure a now bright happy and confident smile. If you suffer from overcrowding, 6 month braces are a fantastic and time-effective option that you should consider to improve your smile. ZacEfron is another celeb who has had some wonderful results with cosmetic dentistry. As a teenager he had a gap between his two front teeth, now they are perfectly aligned. He had Invisible braces which helped to pull his teeth together and give him a more ‘adult’ smile. Tooth whitening was also used to help brighten up Zac’s new smile. Victoria Beckham had a fantastic celebrity smile makeover. Her teeth were crooked and she had a gap at the front of her teeth. Victoria looks like she has had some porcelain veneers on her front smile line and some tooth whitening sessions to brighten up her smile. George Clooney has always been a big hit with the ladies but his smile was far from perfect many moons ago! A chronic teeth grinding habit (bruxism) left George with tiny stubs for teeth. Porcelain veneers were used to lengthen the teeth that Clooney had ground down and gum-lasering was carried out to expose more of his natural teeth. Cheryl Cole had quite crooked teeth and she had pointed incisors that were quite fang-like. Her teeth were straightened and the ‘fangs’ were reshaped to give her a more beautiful smile. Whitening was also carried out on her stained teeth and she now has some dazzling white porcelain veneers to give her that perfect Hollywood smile. For all of the non-celebs among us, teeth cleaning and whitening can dramatically change your smile. Techniques like cosmetic bonding and 6 month braces can really change your whole looks and the costs are a lower than you might expect nowadays as cosmetic dentistry is becoming more common. Talking to a good dentist will help you find the most effective way of getting that perfect smile you are looking for!